The American Heritage Dictionary defines a medley as "an often jumbled assortment; a mixture" and that's exactly what this cereal is. Strawberry Medley All-Bran is a combination of bran flakes, bran squares, granola clusters and freeze-dried strawberry pieces. Sounds fun, right? Unfortunately, this particular mishmash isn't as fun as you might think. It has a few good things going for it. When you open the box, you get an inviting whiff of strawberry. When you're eating the cereal, the strawberry pieces are actually very good. Sadly, they're the only thing that's very good. The flakes and squares in the cereal are particularly bland. If "dry" were a flavor, that's what I'd use to describe them. I'll admit that I liked the first couple bites of this cereal. The strawberry flavor is undeniable and it adds a lot to spoonfuls that have strawberry pieces. But as you eat more and more of the cereal, the non-descript, bland, dry flavor of the main cereal pieces begins to overwhelm the strawberry flavor and the result is dull bowl of cereal. To make matters worse, the bran flakes retain their texture in milk better than the squares. By the end of the bowl, everything that seemed fun about mixing cereal pieces together just seems sad... it was a bowl of mildly mushy flakes paired with extremely mushy squares. Minutes ago, I finished a small bowl of Strawberry Medley All-Bran and I swear on my mother, I don't think I encountered a single granola cluster. Dismayed, I took handfuls of the dry cereal out of the box to examine the pieces. Finally by the third handful, I saw a few random oats... clusters they were not. To it's favor, this cereal does provide 10 grams of dietary fiber per 1 cup serving. 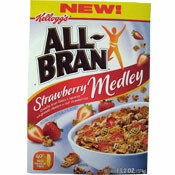 What do you think of Strawberry Medley All-Bran? I often didn't eat breakfast but once I tasted Strawberry Medley I started eating breakfast everyday. I love this cereal and am very disappointed that they discontinued it. This was my favorite cereal! I couldn't find Strawberry Medley anymore either so emailed Kellogg's and they told me they no longer make Strawberry Medley since it wasn't a good seller. I am so disappointed, I loved that cereal. Great! Easy, delicious way to get fiber in your day and it doesn't taste like cardboard!! Great tasting healthy option! I love this cereal!!! I eat it every morning! I can't find it in stores, Why is that? I'm on my last box and I'm getting upset. I've looked everywhere. Where can I buy this great cereal? It's delicious - variety in textures and flavors. Definitely my favorite cereal. It flies off the shelves here. Yum yum good for you and great tasting! Really really love this cereal, Mr. Breakfast is crazy. I love this cereal! It makes me regular, it's very healthy, gives me energy and I feel just great. I completely disagree with breakfast guy, this cereal is very tasty and it doesn't get mushy. I wish I could find it in more stores though... I am addicted to it! This cereal is pretty good but the best part is that it has made me regular, I feel healthier, some products that contain fiber actually make your constipation worse but not this cereal... I love it!!! 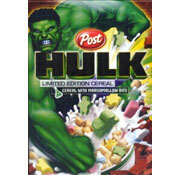 I totally loved it as well, I also disagree with Mr. Breakfast, this is the only cereal that I will eat now. I LOVED it!!!!!!! I disagree with Mr. Breakfast. I did not experience any bland, dry flavors. This is my new favorite cereal... and it wasn't mushy by the end of the bowl.